I couldn’t resist. I had plenty of inside chores to complete, but the golden brightness of the glorious fall day drew me outside. With the sun dazzling in the clear blue sky, it would have been sinful not to soak it in. So I did. Sunny days in late fall in northeast Ohio are rare. November and December are historically our cloudiest months. I wanted to take advantage of the beauty. I soon discovered that I wasn’t alone. Of course, preparations for the holidays ahead already had people out and about. Folks seemed to double down on this beauty of a day. Traffic of all types kept the byways busy. It was a day of contradictions. I passed an Amish man eating an ice cream cone while cruising along in his black buggy. It wasn’t even 10 a.m. It was 47 degrees Fahrenheit, proving once again that temperature is not a prerequisite for enjoying yummy ice cream. Congestion reigned at the square in Mt. Hope, not an uncommon sight on sale day at the livestock auction. The sun spotlighted a farmer on a tractor chatting on his smartphone. The conversation must have been agreeable. He grinned like a Cheshire cat. Up the road a piece, a flock of sheep grazed in the hollow of a broad, bowl-shaped field. The wooly coats glistened against the straggly spent vegetation that still stood above the close-cropped grass of the pasture. 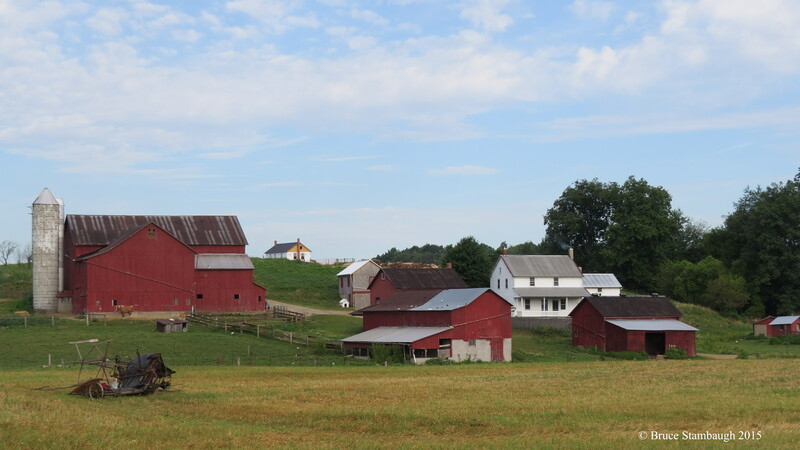 Amish farmsteads turned uncharacteristically patriotic. A curtain of Navy blue sky served as the backdrop for the starched white clapboard houses and coffin-red barns. The sun bathed everything everywhere. Even long-neglected faded siding begging for a proper coat of paint stood out. Rusty windmill blades glinted in the brightness. A pair of Red-tailed Hawks circled and soared low over a woodlot and disappeared. Pigeons claimed barn roof ridges, white and gray backs to the radiant warmth. By afternoon, sunbeams streamed in on a factory office desk. The busy boss himself beamed in the glory of the day’s beauty. A pair of Amish preschoolers, probably brother and sister, fearlessly coasted their wooden wagon down the gently sloping township road. It may have been late November, but their joy said summer. An Amish worker skillfully wrapped a finished piece of machinery in clear plastic to protect its fresh coat of paint during shipping. He was more than glad it wasn’t snowing. Windows on a passing school bus were all down where the students sat. I doubt the jolly driver cared. Near dusk, a stand of hilltop trees filtered the southwestern glow. Nevertheless, the sun’s strength still outlined a downy woodpecker’s fine feathers like an angel’s halo. The usually nervous bird seemed to relish the moment unless it simply wanted to pose for a cameo photo. The sun set too soon and unspectacularly. On the opposite horizon, November’s frosty moon rose full. Its soft illumination stunningly highlighted thin wispy clouds, a pale but dramatic imitation of sunrise. By day, the sun radiated more than welcomed warmth. It energized humans, Holsteins and wallowing hogs. By night, the recycled solar rays washed the earth in a rich beauty not often seen without a sparkling snow cover. I hated to do it, but I had no choice. I pulled the bedroom drapes. I wasn’t shutting out the light so much as keeping the bright beauty of the day internal. Its brilliance still burned within me, an immeasurable, lustrous love that lulled me to sleep. 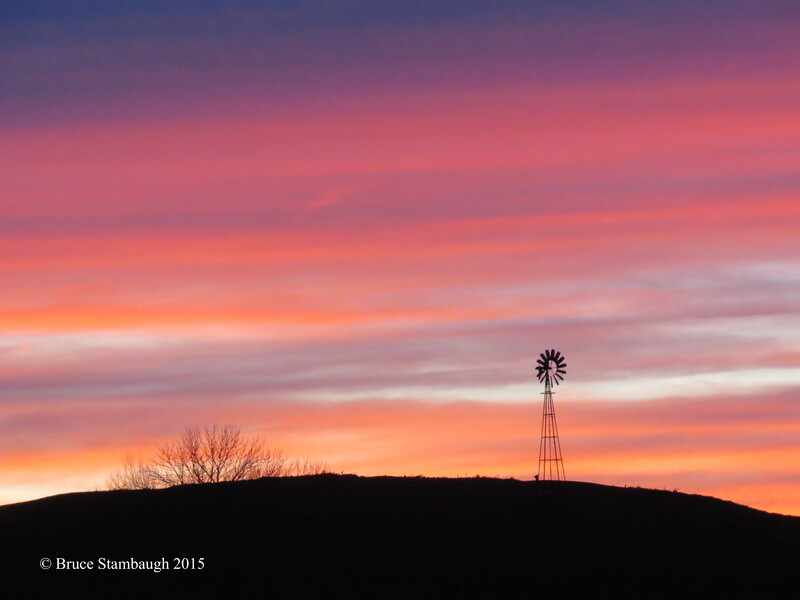 With the stubby brush and the windmill, this sunset scene looks like it could be “out west.” Not really. 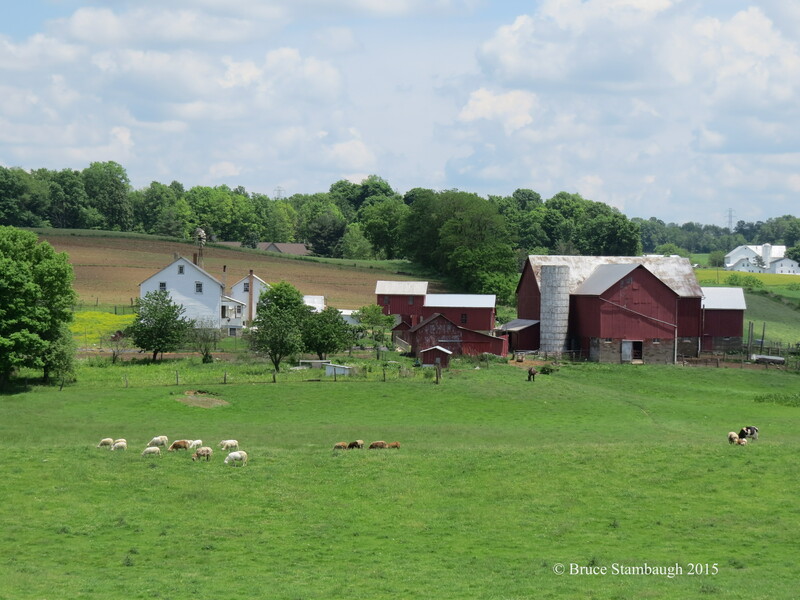 I shot this photo a few days ago here in Ohio’s Amish country. In fact, I merely had to step into the backyard for the shot. I used my telephoto lens. The setting is the top of a hillside pasture about a quarter of a mile behind our home. The “brush” is simply the top of a tree that protrudes from the other side of the hill. “November Sunset” is my Photo of the Week. When I awoke just before dawn a few days ago, I thought there would be no chance whatsoever for a lovely sunrise. Fog surrounded us. Nevertheless, I kept my eye on the east as I prepared for the day. I wasn’t disappointed. In a matter of minutes, a breeze stirred, the atmosphere warmed, and the fog rapidly dissipated. I could see the sun about to break through. 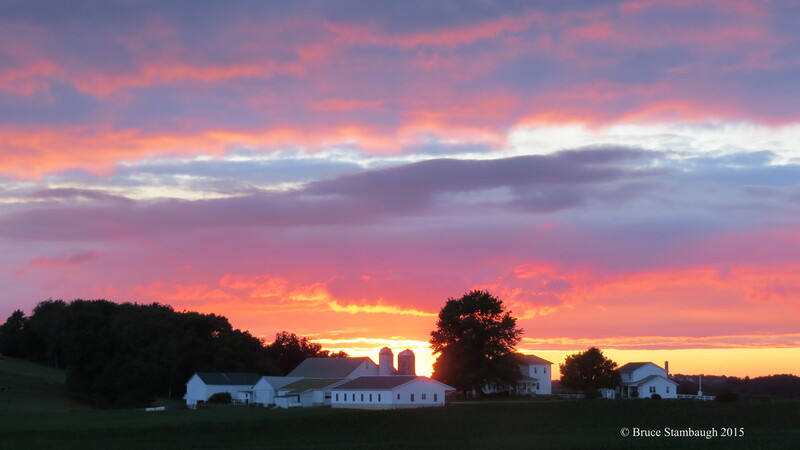 I hustled across the road to the neighbors to catch a glimpse of another inspiring sunrise in Ohio’s Amish country. 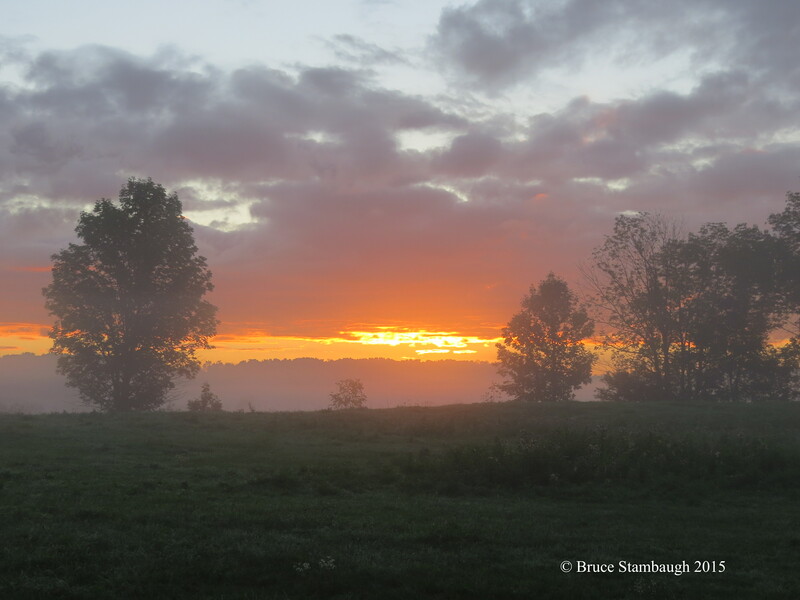 “Misty Sunrise” is my Photo of the Week. I love to look for patterns in photos. There are plenty on display here, even if you only look at the various textures of the roofs on the congregated buildings. Also note the details that enhance the plain red and white buildings. Did you see the brown horse against the barn wall? How about the Rock Doves, aka pigeons, on the roof of the outbuilding in the foreground? Or the smoke coming out of the chimney? See how many other details you can find as you explore this photo. “Details in Patterns” is my photo of the week. After another wonderful summer day with partly sunny skies, pleasant temperatures, light breezes and little humidity, I’m watching the rain pour down. It’s July. It’s Ohio. It’s the way weather happens here. 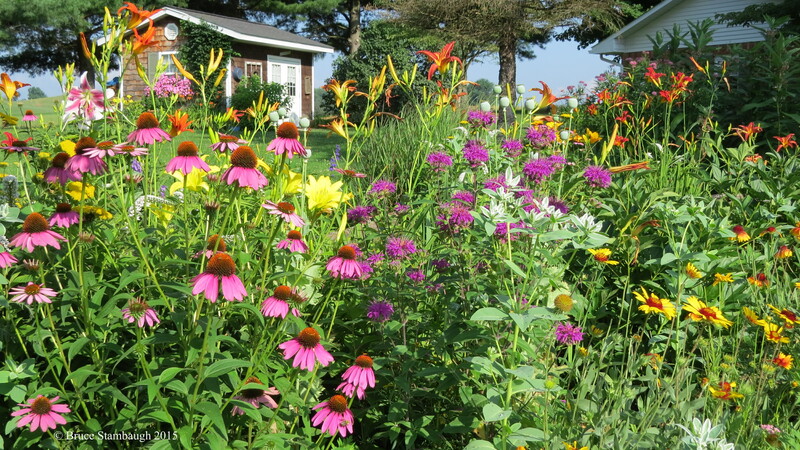 After the harsh winter and cool, damp spring, we were ready for an old-fashioned summertime. To be clear, that meant nothing but clear skies and warm sunny weather through September. Of course, that never really has happened, never will. But we can dream can’t we? The truth is we need to be honest with ourselves about summer weather in Ohio. We can have good days, better days, and then there’s the rest. Some of Ohio’s summer weather can be downright nasty, if not hazardous. The consequential weather can be fearsome, and put a kink into your best-laid plans. A picture perfect day can morph into our worst nightmares. Tornadoes, hail storms, damaging thunderstorm winds are among the wicked weather menu options. The July 1969 flood comes to mind. I didn’t live in Holmes County then. Still, the storm was widespread, and I saw damage and destruction. I was an intern reporter for The Plain Dealer in Cleveland. I headed to the Chautauqua Institution near Jamestown, New York for the holiday weekend. I didn’t stay long. All the activities got rained out. On the way back to my apartment in a western Cleveland suburb, I passed several ConEdison power company trucks in New York heading west on the interstate. I stopped at the newspaper on the way back and saw photos of boats being bashed against the rocky lakeshore. Power was out in much of the Cleveland area, including my neighborhood. In fact, one of those ConEdison trucks that I had passed was parked in front of my apartment. Powerful winds drove the pouring rain right through the old, thick brick walls of our building. Huge trees snapped in a nearby park, and teenagers directed traffic at busy intersections. Six weeks later I saw the damage done in Killbuck, my new home. Folks were still trying to recover from the devastating flood that touched nearly every building in the creekside town. Weather is to be both appreciated and respected when it interrupts our human plans. When we hear thunder, we need to take cover. Avoid those treacherous floodwaters and find another way around. As a weather buff, I cringe when I hear of people being struck by lightning playing golf or baseball, and when I learn of youngsters being swept away playing in swollen streams. Those are sad stories that need not have happened. Weather is a lot like life, isn’t it? A wise Amish farmer once told me, “We just have to take whatever weather comes our way.” I think that philosophy applies to other aspects of our lives as well. How do we respond when one of life’s happenings strikes us like a lightning bolt? A surprise medical diagnosis by the doctor, an unexpected budget-breaking bill, a broken relationship, the death of a loved one can all wash over our emotions like a flash flood. It’s summer in Ohio. Not every day will be sunny, nor will everything that happens to us be fair. We can’t change the weather, and sometimes can’t even alter our personal circumstances. What we can do is keep on hoping for sunny summer days. It won’t be all cloudy and miserable forever. It’s July. It’s Ohio. It’s the way weather and life happen here. 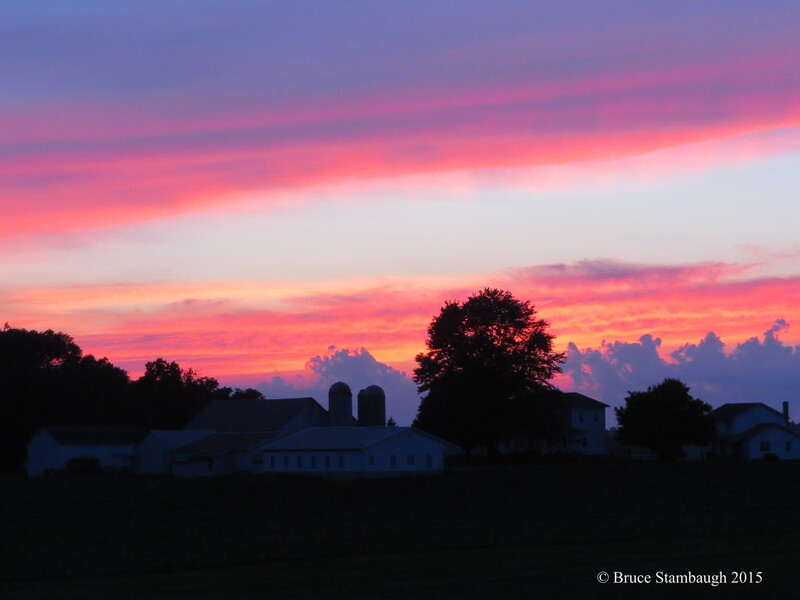 Each summer solstice, I stand at the northwestern corner of our property here in Ohio’s Amish country and watch the sun sink between the twin silos on our Amish neighbor’s farm. I guess it’s my version of Stonehenge. Normally, if the sky is clear, I often see a golden orange glow. Not this year. I watched the sunset on the summer solstice again last Sunday evening. As sunsets will do, the colors in the evening sky seemed to change by the minute. I kept shooting and shooting photos. I thought the roses, violets and baby blues painted above the silhouetted farmstead in this shot created an amazing scene. 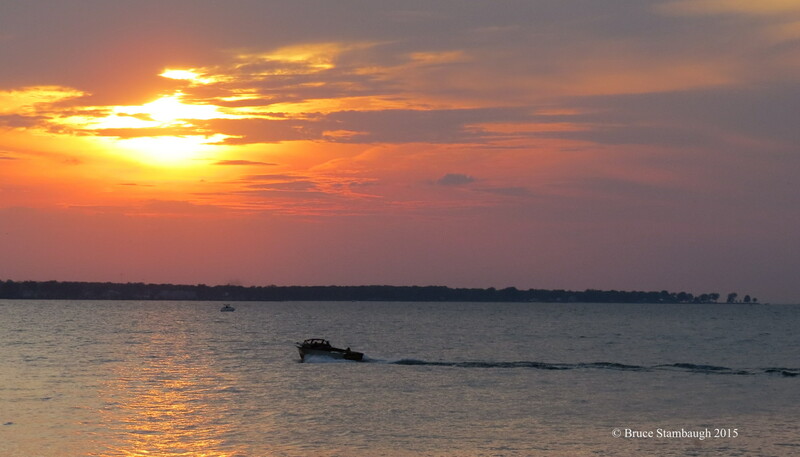 “Summer solstice sunset” is my Photo of the Week. Of all the photos I shot this day, I thought this one was the finest. 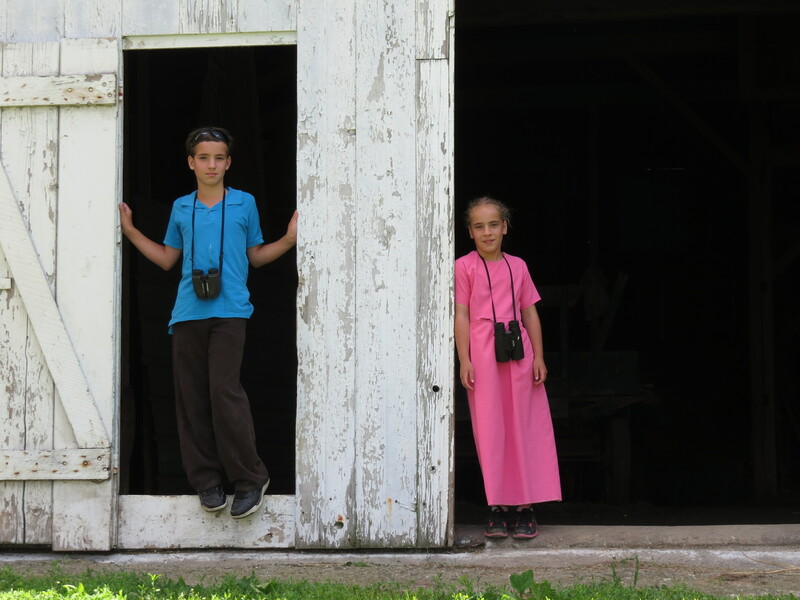 With the help of Ian and his sister, Lydia, I had been leading birding field trips to their grandfather’s bank barn. Birders from near and far wanted a glimpse at some baby Barn Owls and some recently hatched Kestrel chicks. 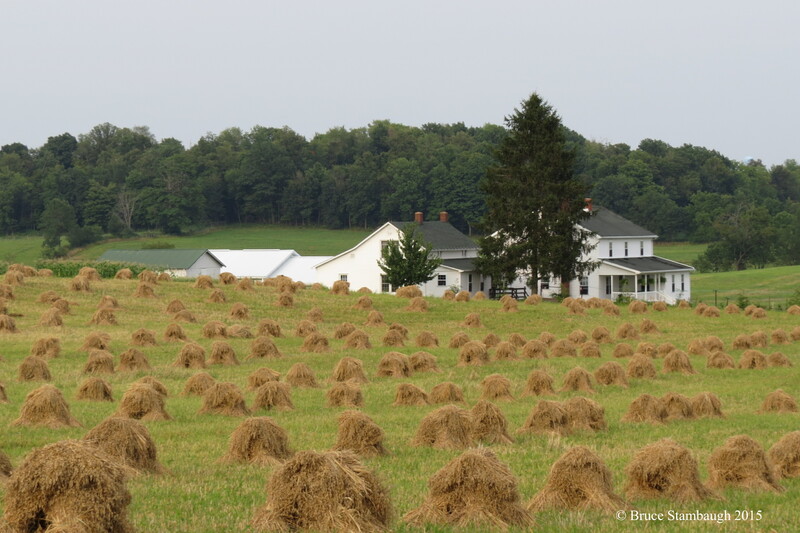 Amish are noted for being conservationists. This family was no different. Besides the boxes for the owls and kestrels, they had several bird feeders filled with seeds for backyard birds. In addition, Ian and Lydia pointed out a Ruby-throated Hummingbird’s nest and a nest just now being constructed by Cedar Waxwings. The nests were only feet apart in the same tree in their front yard. 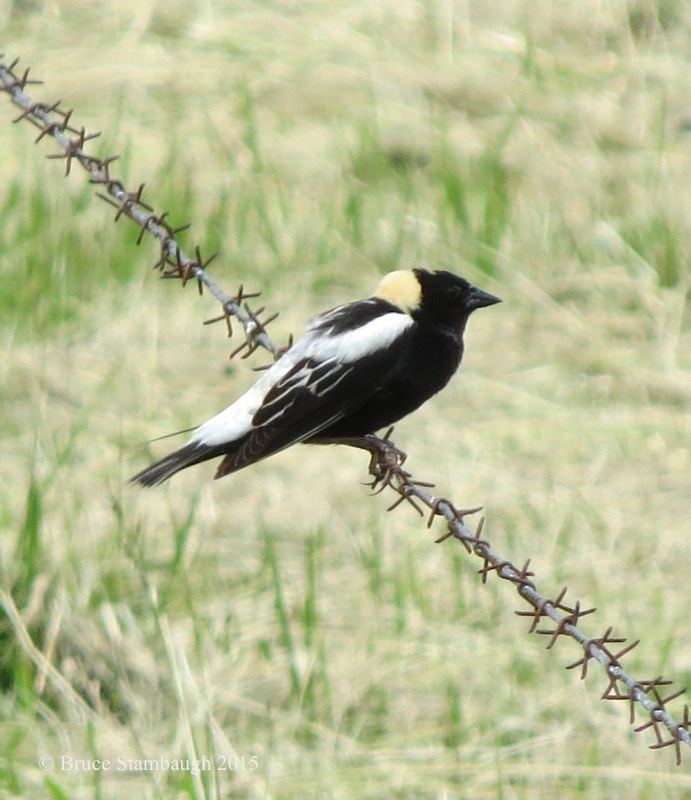 Across the road Bobolinks, Eastern Meadowlarks, Savannah Sparrows, Red-winged Blackbirds, Brown Thrashers and other birds of the field sang. They put on a great show for the folks on the birding tours. Some even posed for photos, which I took advantage of. The Barn Owls and Kestrels were “lifer” birds for several of the folks on the tours. But for me, it was this shot of Ian and Lydia during a lull between groups that I cherished the most. Since they were youngsters, I was permitted to take their photo. The relaxed poses of Ian and Lydia, and the bright colors of the shirt and dress contrasting with the barn’s white-washed siding and the darkness of the barn’s opening made “Blue and pink” my Photo of the Week. Summertime. Isn’t that an absolutely gorgeous word? Let it roll off of our tongues and past our moist lips slowly, magnificently, joyfully. Those of us who reside east of the Mississippi River and north of Disney World endured a long, hard, cold, snowy, record-setting winter. It’s truly a blessing to say that lovely word, summertime. It’s not like we’ve earned summer either. We just have longed for the expected warmer, more pleasant weather, plus its immeasurable benefits. Though the summer solstice doesn’t officially arrive until June 21, that’s become insignificant, even obsolete. Here in commercialized America, we’re accustomed to the definition of summer as the days between Memorial Day and Labor Day. I know I am not the only one that is thankful that June is here. With apologies to Walt Whitman, I can indeed see and hear America singing. All I have to do is be attentive. 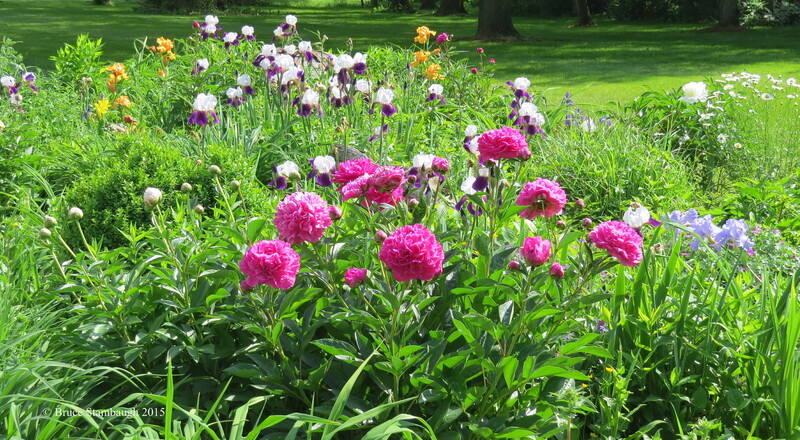 The early summer flowers, the irises, poppies, and petunias are or soon will be blooming. So are the weeds. The days are not only longer when measured in daylight hours; they are warmer and more humid, too. That is the norm. Of course as part of America has already experienced, we’ll likely have our share of hazardous weather. That, too, is within the season’s nomenclature. 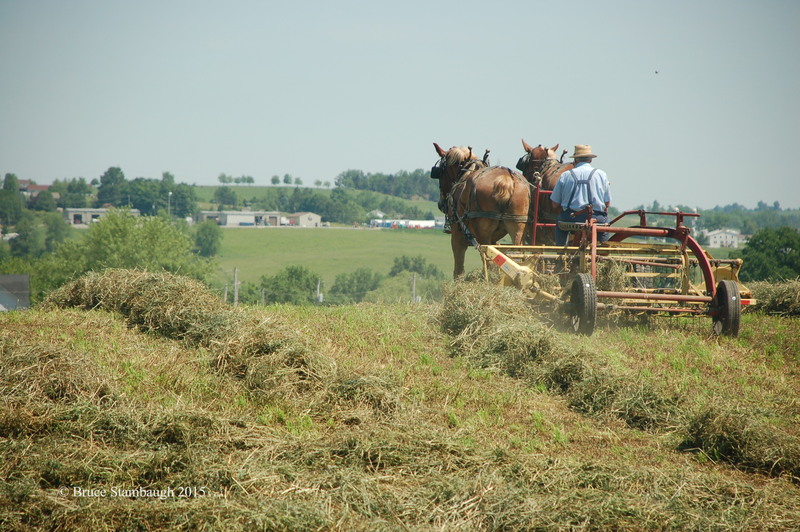 The first cutting of hay, whether by horse and sickle or tractor and big round baler, has commenced. School years have ended, except for educational institutions that offer additional classes. They are appropriately called summer school. We humanoids aren’t the only one’s happy about the transformation. The birds and the bees have gotten a head start on articulating their predestined survival behaviors. Shorebirds, songbirds, and yard birds will fledge their young, and begin a second brood if there is time. Soon lightning bugs will be rising from fields and grasses, blinking under spacious, starry skies. It’s a scene of which I hope I never tire. If the grandkids visit, we’ll fill jars and watch the incredible insects glow, and then release them to do their thing, the bugs not the grandkids, that is. Boats big and small will cut temporary wounds into placid waters, which will heal themselves with no thought whatsoever by either the offender or the offended. The squeals of a toddler’s first catch of the year or the rich laughter of children diving into tepid water at dusk will confirm summer’s presence. 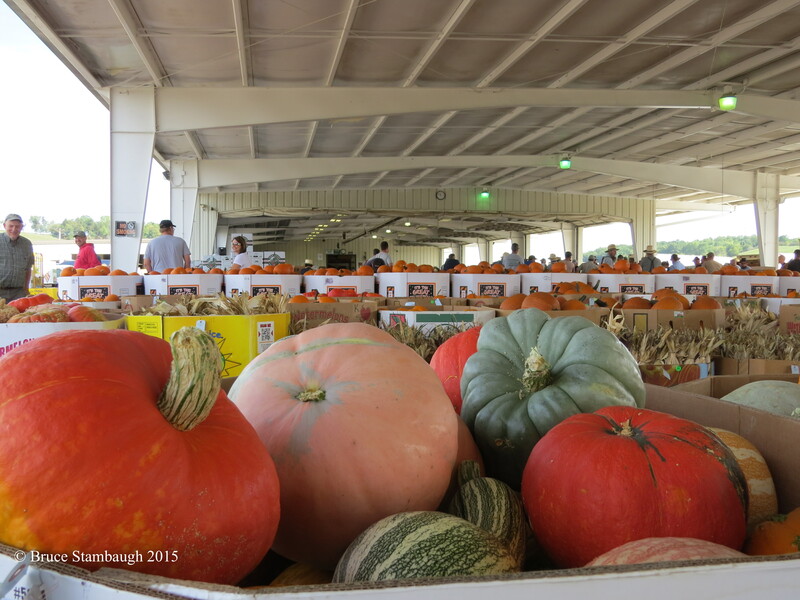 Produce stands have already begun to present seasonal rewards. Patient diligence will yield even juicier, tasty results. I gladly anticipate fresh buttered beets, succulent heirloom tomatoes and savory, sweet mint tea, leaves right from the garden. Long-delayed chores can finally be completed. Weathered house siding will be revived with fresh coats of brightness to complement immaculate gardens full of rainbows of color and busy insects and critters. I’ll sit on my back porch on a luxurious summer’s Sunday evening and listen to the clip-clopping of the horses as they carry home families early and courting teens late. I can hear the latter coming from a half-mile away, boom boxes blaring. 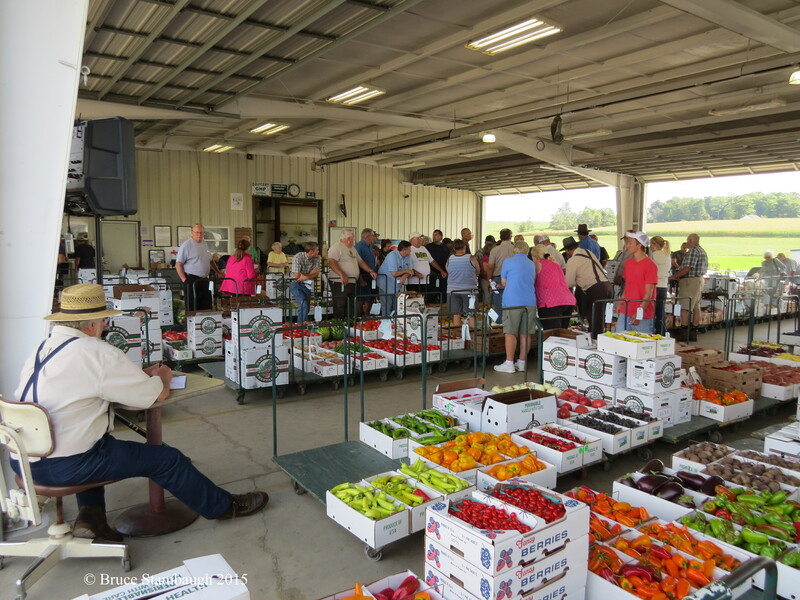 Vacations will bring thousands of tourists to Ohio’s Amish country, where I live, to witness some of those native interactions. Wise locals will flee to beaches or mountains or solitude. Amen to that and a hardy welcome to all that summer has to offer.